Let’s get serious and use home made open wire line made from 2mm diameter copper spaced 150mm. The very popular 19strand windowed ladder lines using CCS do not have sufficient copper to give copper like performance, the single core CCS is marginal. This analysis looks at transmission line losses only, ATU losses are significant and are likely to be different in each scenario as the load presented to the ATU changes. Let us calculate the line loss for the tuned feeder option. 0.87dB is quite reasonable given the quite long feed line. Just under 20% of the ATU output power is lost in the transmission line. Note that the loss on the open wire section is slightly sensitive to the load impedance it sees, so variations in the dipole will affect loss in the coax section to some extent. The loss in the balun in differential mode will be insignificant compared to the coax loss, so I will ignore it. Lets repeat the analysis above but for the half length open wire line. Not surprisingly, the loss at 0.52dB is a little over half the full length line. Now lets calculate the loss in the LMR400 with this load. There is an issue with the model’s source data for LMR400 in that it is based on data for 30-6000MHz and to use an extrapolation at 1,8MHz increases uncertainty. Note that the loss on the coax section is sensitive to the load impedance it sees, so variations in the dipole or open wire section will affect loss in the coax section. The model suggests that looking into the open wire line section, the loss on the coax section is likely to be around 9.1dB. Adding the calculated open wire line loss, we get 9.1+0.52=9.6dB. Over 90% of the ATU output power is lost in the transmission line. Loss in line sections is sensitive to the load impedance each sees, more so with the coax section, so variations in the configuration will affect losses. The tuned feeder scenario has transmission line loss around 0.9dB. 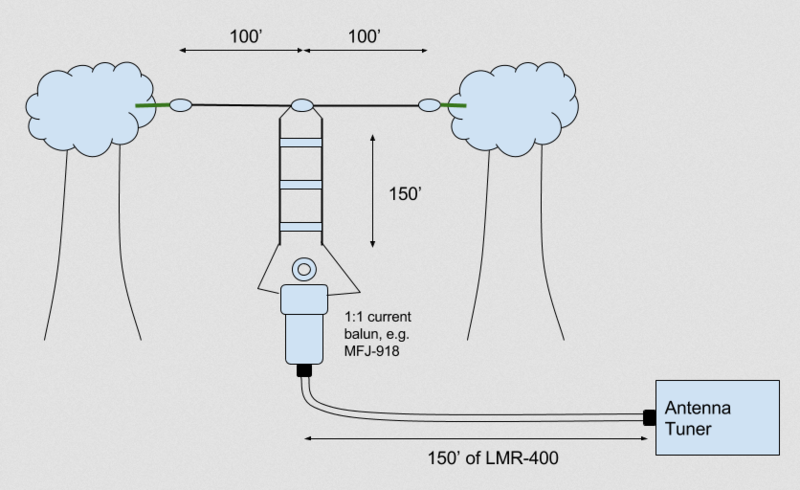 The hybrid feeder arrangement has transmission line loss closer to 10dB. That is a significant cost to enable burial of his feed line. Note that the loss in an ATU can be very sensitive to the load impedance it sees, so variations in the dipole and line sections may affect tuner loss.